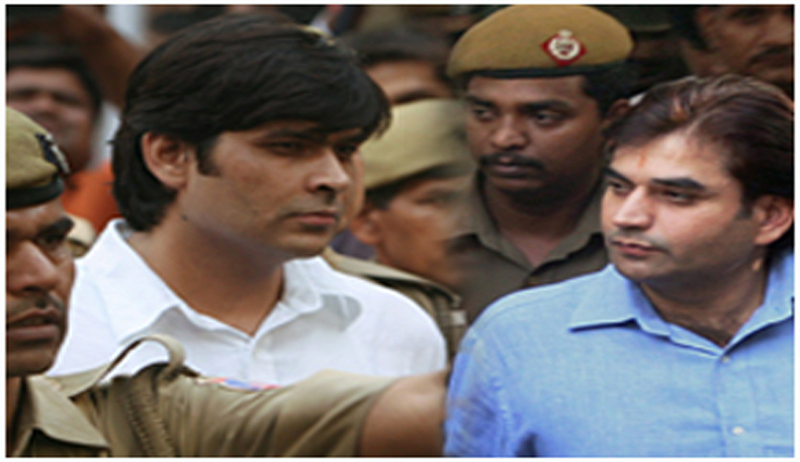 Refusing to award death sentence to Vikas and Vishal Yadav in the much hyped Nitish Katara murder case, a Division Bench of Delhi High Court has via a detailed 594 page judgment turned the life imprisonment (LI) to 25 years of actual imprisonment without consideration of remission and a fine of Rs. 50 Lakh each u/s 302 along with rigorous imprisonment (RI) of 10 years under Sections 364/34 IPC which will run concurrently with the sentence given under Section 302/34 IPC. The Division Bench comprising of Gita Mittal & J.R.Midha JJ stating that the removal of all sources of identification and burning of the body beyond identification was part of single premeditated plan u/s 201 executed by the defendants, awarded RI for 5 years with fine of Rs. 2 lakh and said that the said sentence will run consecutively to the 25 years of actual imprisonment awarded to the defendants, making it 30 years of imprisonment in toto. The third convict Sukhdev Yadav on account of his involvement being influenced by the fact that he was the employee of Vikas Yadav’s father and that he was not a person of substantial means, was awarded LI of 20 years of actual imprisonment without consideration of remission along with a fine of Rs. 10, 000. The Court also considered and recorded the fact that Nilam Katara, the mother of the deceased, had not prayed for the enhancement of the sentence against him. Pertinent to note that yadavs were convicted by the trial court also under sections 302/364/201 r.w Sec 34 IPC. They were sentenced to LI + fine of 1 lakh each u/s 302 IPC and in default of payment of fine, to undergo simple imprisonment (SI) for 1 year. U/s 364/34 IPC they were sentenced to RI for 10 years + fine of Rs.50,000/- each, in default to undergo SI for 6 months and RI for five years and fine of Rs.10,000/- each under Section 201/34 IPC, in default, SI for three months. All sentences were to run concurrently. Sukhdev Yadav was also found guilty for commission of the same offences under Sections 302/364/34 and Section 201 of the IPC. He was sentenced to undergo LI and fine of Rs.10,000/- u/s 302 IPC, in default to undergo RI for two years; RI for seven years and fine of Rs.5,000/-, under Section 364 IPC, in default RI for six months; RI for three years and fine of Rs.5,000/- under Section 201 IPC, in default, RI for six months. All sentences were directed to run concurrently. The bench said that the meticulous planning and execution of the crime, the brutality with which it was executed and various other factors and circumstances certainly brought the present case in the category of ‘rarest of rare’ cases, however, referring to various judgments of the Supreme Court, dissuaded from invoking it’s jurisdiction to impose the death sentence considering the irreversibility of the death sentence and the possibility of any Judge on the Bench taking a different view. However, in an incorrect understanding of what is meant by ‘Life Imprisonment’, the Court said that the depravity in the mindset and planning of the crimes, brutality in its execution, post crime conduct during investigation and trial point to one essential fact that a life sentence which means only 14 years of imprisonment was grossly inadequate in the present cases and that these defendants did not deserve remission of the life sentence imposed on them by application of Section 433A of the CrPC. After Shatrughan Chauhan’s judgment delivered last year, awarding death penalty in country has even got narrowed down from the ‘rarest of rare cases’ now. Interestingly, the judgment deems Life Imprisonment as only for 14 years. Section 45 of IPC defines Life as Life of a human being. Sec 53 gives LI as one of the punishments. It has been held in a catena of judgments that LI means imprisonment for natural life of a person. The expression 14 years has been read into by courts from Sec 433A of CrPC which merely says that before 14 years commutation/remission is not possible. To award harsh penalties, punishments such as 25 years have been recently adopted by courts, which is totally strange to Sec 53 which does not at all prescribe such punishment. Such judge centric sentencing instead of a principled one is very harmful for healthy democratic traditions. The only remedy left open to both parties now is to knock doors of the Supreme Court for either enhancement or reduction of sentence.